The Master Breeder show award is an honor earned by URCA members in the exhibition of Rollers in the showroom. Any recipient of this award is truly a Master Breeder of our versatile bird, the Birmingham Roller. All URCA members are eligible for this award and no fee shall be charged for the award. a. The exhibitor must be a member of the URCA. b. The exhibitor must have bred and exhibited the bird. Points will not be awarded for birds that are shown by an exhibitor who did not breed the bird. The bird's band number and the fancier who purchased the band must be registered with the Secretary of the club who sold the bands. c. The exhibitor must sign a form stating that he has bred, banded and raised all birds that have received Master Breeder points at a show. Failure to sign this form or falsifying the form, will result in forfeiture of ALL Master Breeder point earned during the current show season. A second refusal or falsification will result in forfeiture of ALL accumulated Master Breeder points. A third refusal or falsification will result in permanent expulsion from the URCA. Each action will require a majority vote of the officers and Directors. 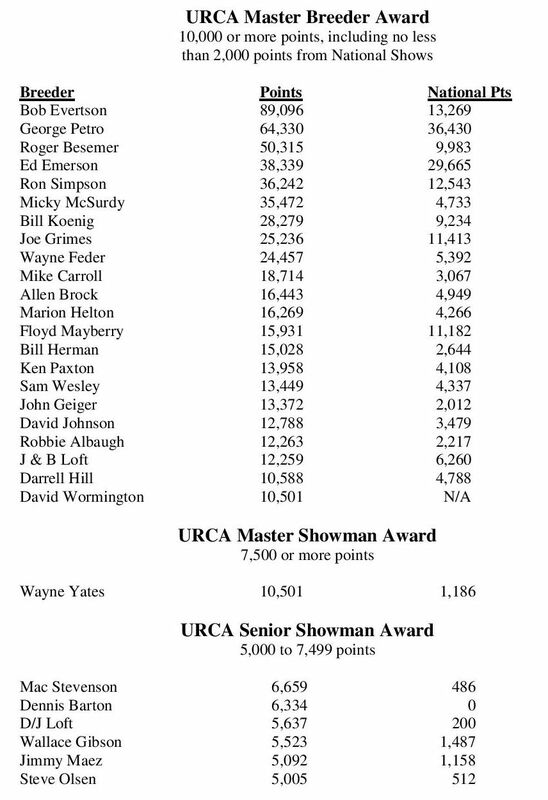 d. The URCA member must earn 10,000 points to receive this award. At least 1,000 of the points must be earned at National shows. a. 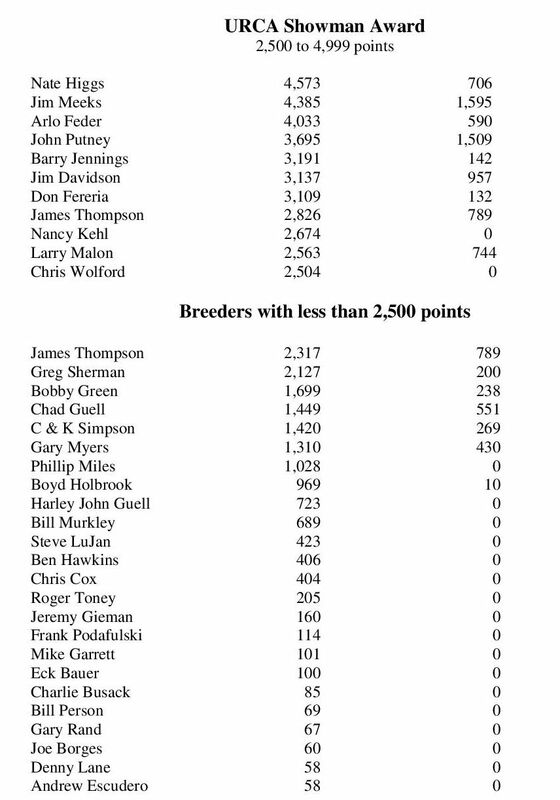 Master Breeder points shall be awarded for URCA District shows, the Young Bird National Show and the National All Age Show and the Louisville NYBS and NPA National Show (if hosted by a recognized Roller club). No District shall have more than 4 District point shows each calendar year unless a show is exempt (NPA or Louisville NYBS) or placed there by an adjacent District or approved by a majority vote of the officers and Directors. b. Any certified judge who judges a District Show shall receive 100 Master Breeder points. Any certified judge who judges a National Show shall receive 200 Master Breeder points. A certified judge can earn a maximum of 300 points within a given calendar year for judging District and National shows. A certified judge can earn a maximum of 1000 points toward the Master Breeder award by judging District and National Shows. c. It will be each District Director's responsibility to ensure the show certification form is properly completed and forwarded to the URCA Secretary/Treasurer (or designated person). d. The Secretary/Treasurer (or designated person) shall be responsible for accumulating and maintaining the Master Breeder records. The total accumulated points will be published annually in the URCA Bulletin. The Officers and Directors of the URCA may approve an Honorary Exhibition Award to be presented to a member of the URCA based upon the member's past exhibition record. In order to receive this award, the individual must have been a member in good standing for the past ten (10) years. A "yes" vote by three-fourths (3/4) of the Officers and Directors is required to approve this award.